The wise in heart shall be called prudent: and the sweetness of the lips increaseth learning. Understanding is a wellspring of life unto him that hath it: but the instruction of fools is folly. 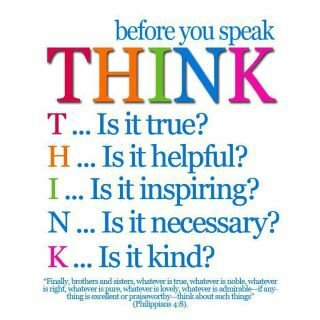 Are you a person who thinks about every word that comes out of your mouth or do you just talk and think later about what you said? I had a professor in college that, when asked a question, he would take several minutes to think about his words and then proceed to answer the question. This drove me crazy! Even if he knew the answer right off the top of his head – he still thought about every word he said. His reasoning for choosing his words correctly is that he wanted to make sure the words he used explained the question in the best way possible. My professor was wiser than I thought! So what exactly is understanding? Understanding is the ability to comprehend or grasp the true nature of something. It is the correct and proper analysis of a dilemma, event, or situation that sees all the angles and consequences. According to our verse, those who have understanding are like a wellspring or a fountain of life. Lord, I pray that each and every day we would seek after YOU and your wisdom. I pray that you would show us how to use our speech for good and not to hurt others around us. Keep us in your care and help us to strive to understand you more and more. The word righteous is probably not one that many of us would wish to use if describing ourselves. But how do we become righteous? The simple answer is that nothing on earth, and nothing we can do in our own strength, will ever make us righteous. That’s the bad news. The good news is that God provided a way to achieve righteousness. God sent Jesus, His righteous Son, who willingly gave His life for us, the unrighteous. Although God knew that we could never achieve the righteousness He desires in us, His love for humanity was so great that He made a Way. But it came at a price. How can we repay the debt that each of us owes to God? One answer is contained in this verse. If we accept the gift of God’s grace, then we must be changed. Our lives must increasingly reflect the life of Jesus. Our friends and family should be able to see Jesus in us, and we should be able to see them through His eyes. When we speak, our mouths become like wells. The words that come from deep within should bring life to others. Therefore, our words should mark us as different. It should be easy to tell the believer apart from those who have not accepted the gift of grace that God gave in Jesus. But sadly, many times what comes out of their mouths tells a different story. The challenge for those who have received the gift of grace is to be easily distinguishable from those who have not.